Orson Scott Card's Intergalactic Medicine Show is this weird animal. On one hand, you have Card cashing on the popularity of his Ender's Game franchise as it features some stories set in that particular universe. The other part of the book is that it's a showcase of the online magazine's short stories, chosen and edited by Schubert and Card. What calls out to me with this anthology is that there's a focus on readability, whether it's Card's stories or that of his fellow contributors. This makes for quick and easy reads as well as an entry point for non-genre readers. Unfortunately, many of the stories, while decent, aren't necessarily your breakout pieces. At times, what's more enjoyable is reading the notes of the authors at the end of each story, explaining how their story was conceived--an interesting read I'm sure to aspiring authors but not so much to the casual reader. 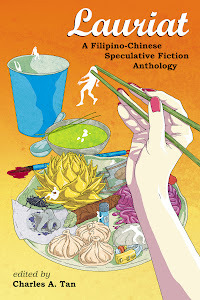 Eclectic picks include three short short stories and a comic. Having said that, there are two stories that come out quite prominently. "Tabloid Reporter to the Stars," by Eric James Stone is both character-driven with shades of humor. The protagonist has a rich background and throw in an interesting dilemma with regards to a ship's exploration. As the author admits in the afterword, thankfully the ending wasn't reduced to a punch-line story. Read with mild amusement and interest. "The Mooncalfe" by David Farland is hands-down one of the best pieces in the book. His descriptions are tantalizing and you have a firm backbone of a story here, whether it's setting, character, or plot. Best of all, nothing seems forced and while I'm not particularly fond of Arthurian fantasy, this is definitely a keeper. The flash fiction pieces save for "The Box of Beautiful Things" by Brian Dolton don't have enough of a literary skeleton for me. They're one-trick ponies and while that's not necessarily a bad thing, leaves much to be desired. Dolton on the other hand succeeds because this is a lengthier piece and he has some talent when it comes to language and evoking the setting. "Fat Farm" by Aaron Johnston is a comic adaptation of a Card story and succeeds well on its own. The art has a right feel to it despite the lack of backgrounds. Like many of the stories featured in this anthology, this is one of those concept stories. There's four Ender stories here, one of which actually got ported over to the Ender in Exile novel. If you're ignorant of that universe, the stories stand well on their own, although again, they feel plot-oriented more than anything else. Fans of the series however will find that these stories fleshes out the supporting characters and it's a welcome read in that context. Overall, again, the big focus of the anthology is towards readability. Many of the stories lack the impact I was looking for although they are all competent. I did enjoy Card's Ender stories although that might be a miss entirely if you're not a fan. 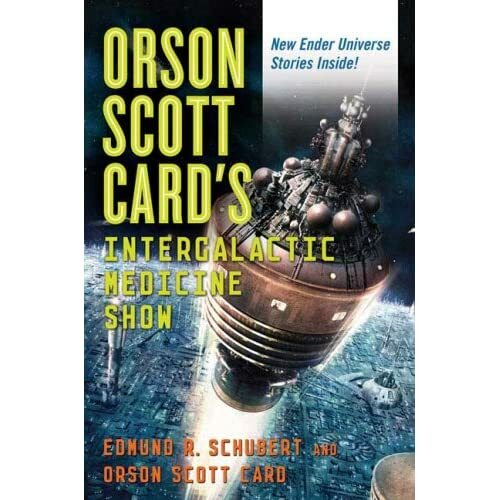 Orson Scott Card's Intergalactic Medicine Show is a decent distraction but overall not the type of book you can sink your teeth into.